For the 13th consecutive year, Harris Boats has been recognized by the National Marine Manufacturers Association with the 2015 Marine Industry’s Customer Satisfaction Index Award. The CSI Award recognizes marine manufacturers whose pursuit of continuous improvement earns them tremendous customer support. 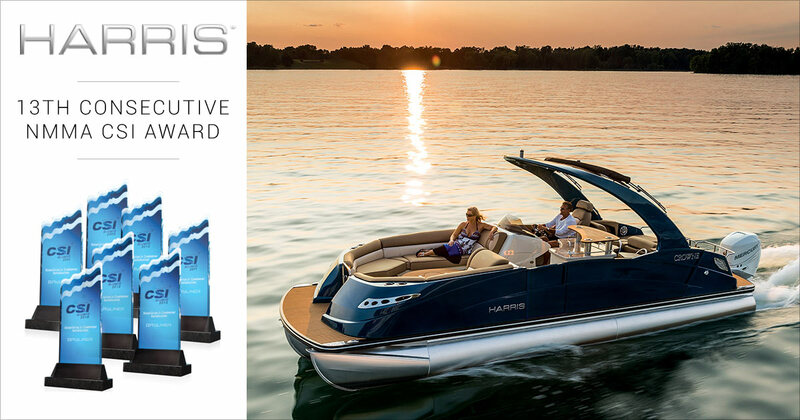 Honored at the 2015 International BoatBuilders Exhibition and Conference in Louisville, Ky., Harris earned its award in the Pontoon Boat category. The Marine Industry CSI Awards program honors participating manufacturers that actively measure customer satisfaction and pursue continuous improvement to better serve the customer. Award recipients achieved and maintained an independently-measured standard of excellence of 90 percent or higher in customer satisfaction over the past year, based on information provided by customers purchasing a new boat or engine during the period of April 1, 2014 through March 31, 2015. For this reporting period, the program surveyed nearly 60,000 consumers. About NMMA: National Marine Manufacturers Association is the leading association representing the recreational boating industry in North America. NMMA member companies produce more than 80 percent of the boats, engines, trailers, accessories, and gear used by boaters and anglers throughout the United States and Canada. The association is dedicated to industry growth through programs in public policy advocacy, market statistics and research, product quality assurance and promotion of the boating lifestyle. For more information, visit nmmaorg. About Harris Boats: Headquartered in Fort Wayne, Ind., Harris has been producing the highest quality luxury pontoon boats in the industry for more than 55 years. As one of the nation’s original boat manufacturers, Harris offers a history filled with design innovation, distinctive styling, unsurpassed comfort, and superior construction. Harris is part of the Brunswick Corporation, the largest marine manufacturer in the world. About Brunswick: Headquartered in Lake Forest, Ill., Brunswick Corporation endeavors to instill "Genuine Ingenuity"(TM) in all its leading consumer brands, including Mercury and Mariner outboard engines; Mercury MerCruiser sterndrives and inboard engines; MotorGuide trolling motors; Attwood and Whale marine parts and accessories; Land 'n' Sea, Kellogg Marine, Diversified Marine, BLA and Bell RPG parts and accessories distributors; Bayliner, Boston Whaler, Brunswick Commercial and Government Products, Crestliner, Cypress Cay, Harris, Lowe, Lund, Meridian, Princecraft, Quicksilver, Rayglass, Sea Ray and Uttern boats, and Life Fitness, Hammer Strength and SCIFIT fitness equipment, and Brunswick billiards tables, accessories and game room furniture and InMovement products and services for productive well-being. For more information, visit brunswick.com.